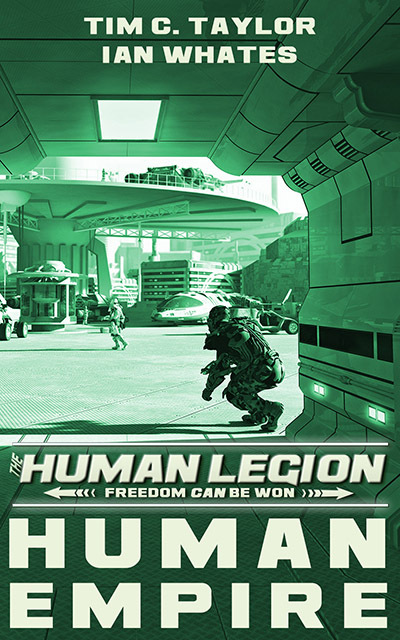 I’m very pleased to announce my first collaborative writing project, Human Empire, the fourth in the six-book Human Legion series, is now available to buy from the Amazon Kindle Store here. It’s got space battles, aliens, treachery… all the usual good stuff. We’re moving up in scale too. Ian and I wrote scenes with dozens of ships and tens of thousands of people. Admittedly, we didn’t exactly describe each person’s experience in detail, but we think there’s a greater feeling of scale in this book, something that’s going to get even bigger with the next one. As normal, the book will initially be on sale for a bargain launch price of 99c/99p or local equivalent for at least a few days. I’ve been told off by fans for making my books too cheap. We’re doing the launch price discount partially to reward readers of humanlegion.com, but also because it’s vital to get the book into the charts so people see it and then impulse buy it. A cheap price can help. If you are in the excellent Kindle Unlimited program (which I know isn’t available in very region) then you could always borrow the book rather than buy it at the launch price. It’s free for you and, strangely, Amazon pays us more money than if you buy the book. Welcome to the modern world of digital publishing! I hope to have the paperback available by the end of the weekend. Congrats on another release … just picked it up via Kindle Unlimited ..
Look forward to the read and will post a review when done. Just bought it! Can’t to read it again and again!!! Wow .. just checked .. you made it to top 100 in new releases ..
Not good enough, we want top ten!!!! What’s the spirit of the bayonet? Kill, kill, kill with cold steel!! What’s the spirit of the thirsty Brit? Sell, sell, sell for a pint of ale!! Exactly, though i’m hoping to to earn enough for two pints, so Ian doesn’t drink mine. Great point, mustn’t allow pint thievery to be tolerated…. It’s a zero tolerance policy for that offense! Think we reached number twelve. This is the nerve wracking bit. The sales rate has slipped since them as the first blast of fans buying on the first day had gone. Hopefully we dip for a few days and them it builds. That’s what happened with the first three nooks, anyway. I tell all my SciFy friends to read it! 🙂 And twelfth is a decent start!!! Now you’re cooking with Crisco!!! Many thanks, Sgt Mike. Reviews help sell books, especially good reviews 🙂 Even with the not-so-good reviews, I’m always honored that someone has taken the time to read and comment on my work, and the feedback can help make the next book better, so keep ’em coming please! I switch back and forth between Kindle on my phone and Kindle Fire … so at times I will use speech .. and let the Lady Drone voice work it’s way through your text in the book ..
What I have noticed is this .. The “” signs used in the Hummer conversation .. the drone voice in Kindle Fire translates the signs into words .. “Less Than Blah Blah”, “Greater than” to end the sentence. So your intent of the sentence is lost because of the translation of the “”. Is there another character that can be used in the future where this translation error will not occur? Use ” quotes instead perhaps. Not sure what the solution should be. I understand you use the signs to specify telepathy in communication but I was thinking of people who do not have eye-sight .. that may use this means of reading your books. Good point. I didn’t think that through. I think I’ve gotten a handle on digital but I’m still stuck in 19th century thinking. I know some people like to get their books to read to them while their driving too. I’ll try out some alternates and get my kindle to talk to me. I’m sure there’s something I can do that gets the idea across without ripping the listener out of the narrative. Glad to hear the words are working for you, even if the punctuation’s hinky :-). Thanks, Tim. Yeah .. your right .. drivers to .. long trips .. short trips .. blue tooth to car speakers and off they go .. listening while they drive .. all devices can connect that way. That is a good point to. Clarification .. use of the Less Than Sign and Greater than sign.